A few weeks ago I received the following quiz as one of the questions for an exam. The question is about paper folding, something that we all know from an early age, and seems simple but it seems that no-one could answer it. I presented it in this article with my proposed solution in an attempt to show how a frustrating mathematics problem could be set from something so simple in our everyday life. On the contrary, if you look at the resulting paper from the back, you will see an “outer fold”. After n steps, unfold the original piece of paper and place it in front of you. 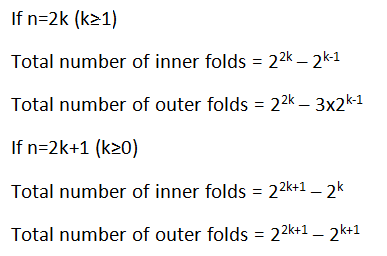 Now calculate the number of “inner” and “outer” folds created on the paper (You position the paper and look at it the same way as how you did when you started folding it for the first time). An example for up to n=3 is demonstrated in the following diagram. A normal dashed line indicates an inner fold while a bold dashed line indicates an outer fold. The number of inner and outer folds for up to n=6 is shown in the following table. Notice that if a fold is intersected by another fold, it is counted as 2 folds. The first task is to find a general formula or algorithm to calculate the number of inner and outer folds after n times. As simple as it seems, there is no quick solution the problem. Since most people don’t have an A0 sheet of paper at home to try to fold so many times, they can only attempt with the common A4 paper and get frustrated after a short while when the paper becomes too thick to fold or the number of folds too big to count. First let us simplify the problem by calculating the total number of folds first. It is simply the total number of grid segments on the original piece of paper after n steps. The first part of the problem is now solved. You can compare the results from our formulas with the example to make sure that the formulas are correct. Interestingly, the total number of folds after each step is equal to the number of outer folds in the next step. “So far you have always been folding by the longer side of the resulting paper after every step (so that you could get an A1 paper from A0, A2 from A1, A3 from A2 and so on). Now you are told that this restriction is no longer necessary and you could fold the paper by either the shorter or the longer side. 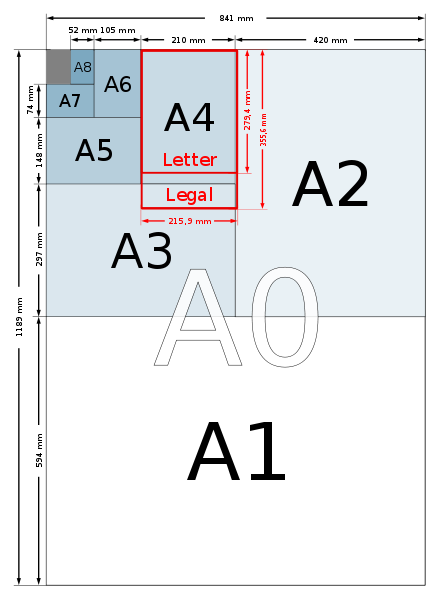 For example, fold an A0 paper (841mm x 1189mm) by the shorter side and you will get a piece of paper of size 420mm x 1189 mm. Although I managed to write a program to solve this, I believe there is no need to describe it here as most readers by now would have understood the concept and would know how to approach this extension of the original problem. The concept which the problem is based on is very simple and does not require any fancy maths knowledge – anyone with perhaps a secondary school education can understand the problem. However, among many whom I have asked, almost all would immediately attempt the question but most would just become frustrated and give up without ever finding the solution, or even the correct approach. I believe it requires a high level of concentration and logical thinking as the number of folds grows exponentially. Setting this as an exam question where students work under stress and time constraints would therefore be unreasonable.